Just in time for the season of lights, be prepared to be dazzled by Bijoux – a Gurgaon-based brand that makes chocolates that taste as good as they look. Inspired by the French word for a delicate and small piece of jewellery, Bijoux is exactly that – bite-sized pieces of perfection that look too pretty to be eaten. Packed neatly inside what may as well be a jewellery box, these picture perfect bonbons glisten with the goodness of real chocolate. Of course, the proof of the pudding lies in the eating, and these delicate gems are each better than the last. Like fruity flavours? Try the Passion Fruit bonbon, which is just slightly tart and enrobed in a thin dark chocolate shell or the very berry Raspberry Rose. Send a box of the rich and robust mocha-flavoured ganache or a very indulgent Hazelnut Crunch that combines hazelnut chocolate spread with tiny crunchy bits. 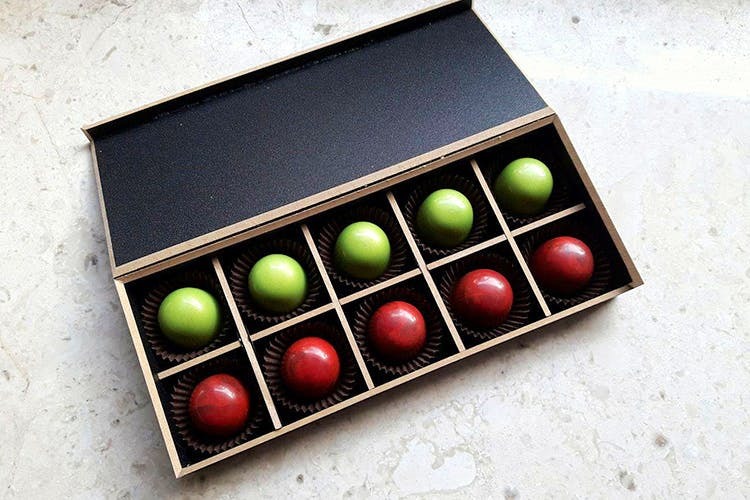 For a sensational play of contrasting flavours and an unexpected twist, pick the Sea Salt Caramel) or our absolute favourite, The Matcha – a white chocolate bonbon filled with a ganache made using real matcha green tea. Take your pick from imported Belgian chocolate, or a signature blend specially created by master chocolatier and brand owner Neha. All bonbons use real chocolate, and the finest ingredients, ensuring each Bijoux is a labour of fine love. A box of 10 of the Belgian variety costs INR 750, and the same box with the signature variety is INR 500. Perfect as posh presents, festival gifts or maybe just something to keep by your side for late night cravings, Bijoux is rekindling our love for sweet surprises.